Corvette "Some Wild Horsepower Out In The Barn"
A true to scale in representation, and highly detailed brilliant artwork scene as shown above on the back of the Tee. 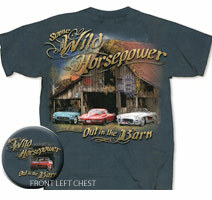 Highly Detailed Small Logo of the C2 1963 Corvette Stingray ‘racer’ on the front left hand side chest of this Tee, and with the Western style scripts “Some Wild Horsepower Out in the Barn” in the background. The script colours phase from Yellow to Orange along with western style pin striping. We have here two generations of Chevrolet Corvette on display, parked up in a “barn” themed scenario. Starting from the left of the artwork, we have the C1 1957 Corvette convertible in its original un-restored baby blue and white glory. The detail of the is artwork is outstanding. The correct front grille arrangement and wheel trim details are exact, through to the intricate detail of the pressings of the side body work, and the subtle hood bulges. Visually the 1957 model was a near-twin to 1956. Engine displacement increased to 283 cu in (4.6 L), fuel injection became optional, and a 4-speed manual transmission was available after April 9, 1957. Alongside the beautiful ’57 is this magnificent C2’ 1963 Red Stingray coupe. This beauty displays that gorgeous ‘split’ rear windscreen, and the detail of the rear tail lights and exhaust exit pipes is exact. Check out those black steel rims with oversize white lettered tyres... You know this baby is ready for a little track or street action! All 1963 cars had 327cid engines, which made 250 hp (186 kW) standard, with optional variants that made 300 hp (224 kW), 340 hp (254 kW) and 360 hp (268 kW). The most powerful engine was the Rochester fuel injected 327cid V8, which made 360 hp (272 kW). Options available on the C2 included AM-FM radio (mid 1963), air conditioning and leather upholstery. New for the 1963 model year was an optional electronic ignition, the breakerless magnetic pulse-triggered Delcotronic, first offered by Pontiac on some 1963 models. Lastly, is this beautifully presented 1962 C1 Corvette in gorgeous white and red duco combination. The detail is well presented, showcasing the standard factory wheel trims on white wall tyres, the side panel pressings with chrome trim detail, and the dual headlight bezels and the full length front chrome bumper bar and grille assembly, is of the detail offered for this era by Corvette. The 1962 model year was the last Corvette with a solid-rear-axle suspension that was used from the beginning. With two new engines it was also the quickest. Engine displacement increased to 327 cubic inches, but dual 4-barrel carburetor engines were no longer available. Hydraulic valve lifters were used in the base 250 hp and optional 300 hp engines, solid lifters in the optional carbureted 340 hp and fuel-injected 360 hp (268 kW) versions. Rocker panel trim was seen for the first time, exposed headlights for the last, until 2005. The background of the Tee illustrates the bold brilliant colours of a country Barn in an evening scene, with overgrown greenery, and the images of the car manufacturers badge emblem scripts on the walls of the Barn. The colour of the script “Some Wild Horsepower Out in the Barn”, phase from Yellow to Orange along with western style pin striping, across the back of this T’shirt. 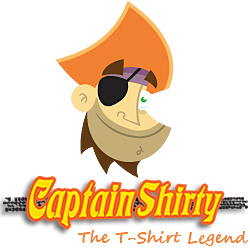 T’shirt shirt Colour: Available in Navy only with Genuine GM Official merchandise Tags.